Earthquake refugee cottages from 1906 that started it all. Jane Cryan, savior of earthquake refugee shacks, has generously allowed us to reprint the prologue from her unpublished manuscript “Hope Chest: The True Story of San Francisco’s 1906 Earthquake Refugee Shacks.” It’s a terrific book you can only read at the San Francisco Main Library’s History Center, as Jane could never find a publisher. Here she tells the story of how 1227—24th Avenue in the Sunset District became an official city landmark. In recent years the cottages have been painted yellow. Although I didn’t know it, on July 16, 1982, the seed for a renaissance of the history of San Francisco’s 1906 refugee shacks was sown and this book began to take shape. For on that day I awoke from a disturbed sleep on a friend’s sofa in an apartment in the City’s Sunset District, and I gave up all hope of finding a small, affordable house to rent. A three month search for a little cottage had been fruitless, and it seemed that my dream of leaving forever a long series of studios, apartments, flats and unending, gardenless concrete and steel was not to come true. I had no choice, I thought, but to shift my search from a rose-covered cottage to something less ideal. The first advertisement I answered that momentous morning told of a flat in a nearby two-family building. Dejectedly, I listened as the rental agent explained that the flat had been rented. “But,” he asked, “would you be interested in a small cottage?” Would I! The cottage was fourteen blocks from my temporary abode, and my friend and I quickly drove by for a look. There it was on this unsuspecting day: a monument to my dreams; a replica of the little houses I had treasured in childhood magazines and books; a doll house surrounded by a sweet picket fence perched atop a larger fence of stone, vacant almost four months save for a family of cats abandoned at the doorstep by the last lodger. Outside, the tiny house looked for all the world like a Monopoly piece, utterly dwarfed as it was by its much larger neighbors. Drab, rust-colored paint hung in sad sheets from the little dwelling. Here and there a wall was painted white, giving the facade a crazy patchwork quilt effect. The fence wept peeling paint and was minus an armful of pickets. Twenty-two windows fashioned in six styles and sizes held panes that barely clung to decades-old glazing. Utility wires criss-crossed the sharply pitched roof and connected with it in a zany fashion. Inside the cottage, I found two score of mousetraps, six pounds of hooks and nails in the walls, and a ton of dirt. Everything seemed miniature: wafer-thin doors with pint-sized push plates, ceilings that I, measuring five feet one inch, could almost reach up and touch, and little book nooks of closets in five teeny-tiny rooms. Even the bathtub and sinks were Lilliputian. Still, the cottage was one of the most beautiful sights I had ever seen, and I whooped with joy. “This is home.” I declared. On July 18 I signed a year’s lease on the wonderful, ramshackle place and on July 23 I moved in. My long-worked-for career as a jazz pianist was soon put on hold. I let dust settle on my grand piano, and I forsook a social life. I went through my workdays on remote control, rushing home to spend every spare minute on research and adoration of what I soon came to regard as an art form. With great abandon, I poured my life’s savings and all my future dreams into the little hope chest of a house. I cleaned, patched, puttied, sawed and scraped peeling paint from the front cottage. I pruned and even prayed over every square inch of the place. I felt a little deranged when I began regarding the site as a living being but I didn’t care. I told the cottage, its smaller mate in the backyard and the earth upon which the buildings rested that I loved them. Everyday I thanked Fate for sending me there. I still do. Two months later, with the rental agent’s permission, I’d cajoled the street side half of the cottage’s exterior into glowing like a beacon in a new coat of fire engine red paint with snow white trim. Within, everything was clean, cozy and creamy white. I christened the cottage the “little red house.” I was never so proud of anything in my whole life. In the Fall, I invited my neighbors and a jazz band to a garden party at The Little Red House in celebration of its half-restoration. At that old-fashioned gathering, I received the first answers to my curiosity about the history of the buildings. A rumor made the rounds that afternoon that the front cottage was really three “cabins” cobbled together. Apparently some kind of “relief housing” built for the homeless of San Francisco’s earthquake and fire days of 1906. Nervously, I inspected the “cabin” in which my 600-pound grand piano was housed. By New Year’s Day in 1983 I was committed to finding and documenting other shack survivors, and telling their story to anyone who would listen. It is my pleasure, and the pleasure of John Cleary who lives in the rear cottage, to welcome you to the most important surviving 1906 earthquake refugee shacks in the City of San Francisco. Let’s begin our tour in the front garden. Note the stone fence, constructed of cobblestones from the early streets of San Francisco. The picket fence sitting on the stones was built by Sven Anderson, who honeymooned with his bride Helen, at The Little Red Houses in the 1950s. Study the pup-tent styled roof of the street side shack. It is as nearly like the shacks in the camps as we have found in our survey. The “Mayflower”-like bay window was not part of the original shack, however, the two six-light windows in the front cottage are original shack windows. Most of the 1906 glass in the front cottage’s twenty-two windows has survived the years. When I scraped the old paint from the front cottage in September of 1982, I met with a rainbow of colors… green, white, blue, gray, rust, yellow, pink, black and beige. After conferring with the cottages, I was moved to select the red and white scheme. 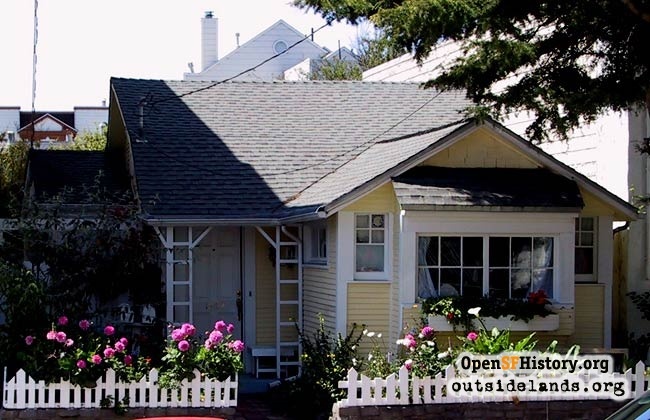 In March, nearly 75 years after their construction and journey to 24th Avenue, the Little Red Houses were the subjects of feature articles in the Sunset Independent and the San Francisco Chronicle. I only hinted to reporters of the plans I had on paper for a society devoted to the resurrection of the shacks and their history. Before I announced my intention I wanted to be certain I had thorough knowledge of the subject, most importantly, the energy necessary to follow through with my ambition. The English left the burned skeleton of Coventry cathedral as a memorial of the German blitz… but when you look for the reminders of the 1906 San Francisco destruction—nearly as great as that of Coventry though with much less loss of life—there are really very few. We do have one Earthquake Monument, but it’s a little different. Unlike most memorials to man’s endurance in disaster, this one was crudely designed, hastily built, and eventually scattered to the four corners of the city. These cottages are charming, but they are small, and in a city filled with glorious architecture, they are aesthetically insignificant—just shacks. Yet when we see them, we should remember that they are something more: they are our Earthquake Memorial absorbed into the fabric of the city. 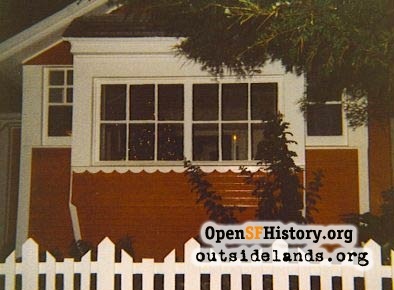 It was, I resolved, time to announce my eagerness to preserve San Francisco’s “Memorials to 1906.” I finished painting the front cottage and my neighbor, Guire John Cleary in the backyard cottage caught refurbishment fever and gave his dwelling a coat of the glorious red and white paint. 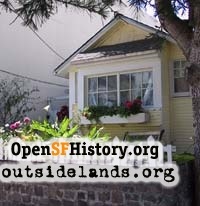 With a lump in my throat on October 1, 1983, I issued a news release to the press and The Society For The Preservation And Appreciation Of San Francisco’s 1906 Earthquake Refugee Shacks was officially born. Page launched 31 March 2004; updated 28 January 2006.